Pacific Design owner Mel Archer enjoys clients who push the limits and lead his shop in new directions. Mel Archer likes “pushy” customers. Not pushy in the obnoxious sense, of course, but clients who push his company, Pacific Design in Hillsboro, OR, towards innovative designs and new construction techniques. It’s a direction he’s taken since the company started in 1985, attracting a growing number of high-end clients asking for something different and unique. 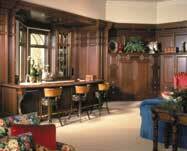 Pacific Design does cabinetry throughout a house. This great room includes a dark stained cherry “Heritage” style raised panel with gothic leaded beveled glass doors and architectural woodcarving bar supports. Photo by Laurie Black. Pacific Design specializes in cabinets throughout the house, with “typical” homes in the $2.5 million range and anywhere from 6,000 to 10,000 square feet in size. Archer grew up doing woodworking in his father’s lumberyard, which had a small cabinet shop. He built furniture and cabinets and eventually operated his own one-man shop for 12 years. In 1985, he joined another one-man shop owner to start Pacific Design, leasing 3,600 square feet of space and some large equipment in the Portland area. The partnership did not work out, and after two years Archer took over as sole owner. His former partner now serves as one of the company’s two contract installers. They branched out to cabinetry for the whole home, and the business grew through referrals, working direct with homeowners and interior designers. Annual sales today are about $2 million, with the business evenly divided between work on new homes and remodels. After a couple of incremental moves into bigger shops, Pacific Design moved into its current 22,000-square-foot building five years ago. Since then, growth has been between 15 and 20 percent per year. A lot of it Archer credits to the company’s 1,000-square-foot showroom. The showroom has 12 vignettes, including contemporary and traditional looks and featuring a wide variety of finishes, veneers, wood species and accessories. The individual displays are made so that they can be removed and set up as show booths, because the company participates in the Portland Home Show every year. 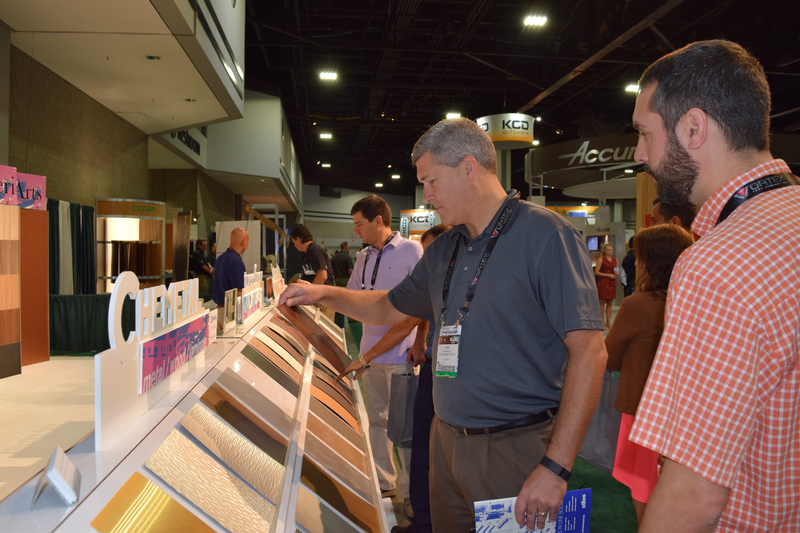 Archer uses the showroom to present innovative designs or unusual veneers to inspire clients to try something different. For example, one display features flush doors in quartered sapele veneer with the grain laid up horizontally and matched all the way along. With a clear finish, the wood appears to move as you walk past it. Introducing clients to new wood species and veneers is one way in which Archer provides clients with the unique looks they seek. He often takes clients over to his veneer broker when he is selecting flitches for their jobs, so they can see all that’s available and also be a part of the project. He has the veneer made into plywood, which allows him to select the core he wants. “Our ability to have really high-quality veneers in many different species is one of our advantages,” he says. Of course, building a well-constructed, high-quality cabinet is at the heart of Pacific Design’s work. Archer says that he has always had a passion for doing things in an uncompromising manner. “It’s right, or it’s not in there,” he says. The company builds a pure European frameless box and everything is doweled. Custom-made plywood is used for all faces. For veneered flush door designs, the veneer is architecturally sequence matched and numbered. There are two basic cabinet lines — "a standard melamine cabinet and “Heirloom,” which features a total maple interior with 14-inch wood edgebanding. All the Heirloom drawers are dovetailed maple with Blum Tandem drawer guides and Blum hinges. The company also uses Accuride drawer slides, accessories and specialty hardware from Hafele, and Raymond Enkeboll components. High-quality specialty finishes are another area that sets Pacific Design apart, Archer says. The company does all its own finishes, and it prefinishes all its cabinets. Everything is finished flat, and each door is done separately to get good coverage, he adds. Pacific Design offers a white epoxy paint instead of foil doors and produces custom glazes, finishes and antique paints. Specialty finishes help set Pacific Design apart from its competitors, says owner Mel Archer. This kitchen features a vintage antique paint finish on the company’s “Windsor” raised panel doors. Chris Archer, who does the company’s engineering and CNC programming, hand-turned the legs for this project. Photo by Laurie Black. The antique finishes are very popular, Archer says. He himself helps develop the look he wants in the finish and then turns the execution over to his finisher, who has been with him for eight years. The company offers health insurance and recently started a pension plan. There also are company picnics and holiday parties for families to get to know each other. There are 14 workers in the shop. Archer’s wife Colleen handles the company finances and is the showroom manager. Their son Chris is an engineer and does all drawings and paperwork for the shop. The company has instituted a couple of successful in-house programs to encourage good shop safety and attendance habits among employees, as well as innovative thinking. The Safety/Attendance Incentive Program is a quarterly program open to all employees and monitored by the shop foremen. Five hundred dollars is put into the pot and split between all employees who have no on-the-job injuries (nor cause any) and do not miss more than 12 hours in excused absences during the three-month period (three days tardiness counts as one eight-hour day’s absence). Keeping work moving smoothly is a goal of the shop layout, which was designed for a flow-through process, Mel Archer says. Raw material starts at one end and finished product moves out the other. The newest machine in the shop is a Weeke CNC point-to-point boring machine from Stiles Machinery. It handles all the dowel holes for assembly, hinges and adjustables and also cuts out curved parts. There also is a Holz-Her Accord 1442 edgebander, a Sandingmaster widebelt sander, a Striebig vertical panel saw from Colonial Saw and a Homag Espana CH12 panel saw from Altendorf America. Pacific Design used to buy all its doors and drawers, but brought production in-house about 212 years ago to maintain total control. The self-contained door department includes two machines from Unique Machine & Tool — the Shape and Sand machine and a door machine which does the coping on stiles and rails. Other equipment in the department includes a J.M. Lancaster door clamp, an SCMI M3 gang rip saw and a Whirlwind cut-off saw equipped with a Tigerstop digital stop system. The 2,000-square-foot finishing room is equipped with air-makeup and independent heating, plus a positive pressure system that automatically kicks in as needed, depending on whether one or both of the room’s two spray booths are operating at the same time. One booth is enclosed, for doing epoxy painted finishes. The company uses Kremlin air-assisted airless sprayers and Graco airless guns and Sherwin-Williams finishing products. There is a Uhling HP2000 case clamp for drawers and another Uhling clamp for boxes in the assembly area. Pacific Design also has an Orion shrink wrap machine and shrink wraps all jobs for added protection. “We blanket wrap products in the truck. But if cabinets are sitting on a job site for awhile before being installed, the shrink wrap protects them and we can take the blankets back to the shop,” Archer says. Pacific Design owner Mel Archer says his showroom is one of the company’s best sales tools. This vignette uses flush sapele veneer on the horizontal with brush stainless accents. Photo by Laurie Black. Although Pacific Design’s work is highly custom, Archer says he has developed a system that enables jobs to be priced easily. Archer adds that he set up a cost system based on a price per lineal foot, with different categories depending on the woods, doors and finish used. Pacific Design also uses Cabnetworks software from Cabnetware, which streamlines design and production, he says. Projects are laid out by the designers and submitted on a disc to Chris Archer. He prepares all paperwork for the shop, including programming for the CNC, plus shop drawings, cutlists and bar codes. He prepares hand-written “yellow pages” for any specials that have to be done — drawings and information on yellow note pads. All the paperwork for a particular job is put on one clipboard and sent to the shop. Chris also creates a separate take-off sheet for hardware needed for a job. At the beginning of a project, shop foreman Ron Currier checks that sheet to see if the hardware is in stock and lets Mel Archer know if something must be ordered. As hardware comes in or stock is pulled, it is put on a cart according to job, so that when the project is ready to be assembled, an employee can take the cart and have everything at hand.